Zeke may end up being the highest priced RB this week if Gurley ends up missing the game. He’s priced at 9K for the second week in a row now, and while it’s tough to pay for 3 stud RB’s if you use Zeke as one…it’s still doable. Tampa Bay has been better on defense over the last month, but they still rank 31st in rush DVOA and just got ripped apart by the Ravens ground game last week. This game opened as a 45.5 point total and was quickly bet up to where it currently stands, as the third highest total of the week, at 48 points. The Cowboys are also 7.5 point home favorites this week. 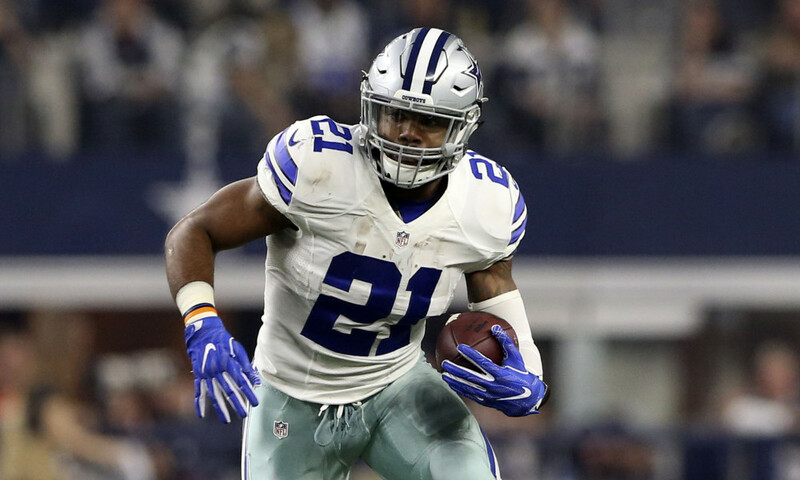 In his career Zeke has averaged 130 rushing yards and 22 point per game as a TD home favorite in his career. Those numbers become even more impressive when you consider his passing game role in recent seasons. This is the first year that they decided to use him in the passing game…so we should expect an increase to that 22 point average. He’s extremely likely to score at least one TD…and he has 150 yard, multi TD upside this week. Dallas is fighting for the playoffs, so they are going to feed Zeke as much as he can handle this week. He’s a very strong cash game play, with plenty of upside for tournaments. CMC is one of the easiest plays on the week. His ownership will be high, but not unbearable. There are 12 games to choose from and some people will be scared off by the new QB. I’d guess he’ll come in at around 25% in tournaments, which makes me want to go double that. This is the perfect matchup against an Atlanta defense that has given up the most receiving yards and receptions to RB’s yet again this season. When CMC played them earlier this season he had 14 receptions on 15 targets for 102 yards. Do I expect 15 targets again? No. But he should see 8-10 even with the change at QB. Any RB that plays on 100% of snaps, has a massive red zone role, and could see double digit targets is someone I want to roster at basically any price and ownership. He’s a very tough fade. This is actually a difficult matchup for Barkley on the ground. The Colts have been an elite run defense, and have forced teams to abandon the run and lean towards a pass heavy approach. The rank 4th in rush DVOA, have allowed the 6th lowest YPC and have given up very few rushing TD’s. The appeal this week is the reception upside. The game script should lean pass heavy since the Giants are 10 point underdogs, and they are going to have to keep up with the Colts anyways…plus they are one of the most pass heavy teams to begin with. But the Colts have also allowed the second most receptions to the RB position. Including last week’s 9 point game…he’s been under 20 fantasy points just twice on the season…with over 32 fantasy points 4 times. At a price discount after his performance last week, and the matchup, he’s a solid option as your second RB this week. Kamara rounds out the 4 studs I’m looking at this week. The Steelers are a tough matchup for RB’s, but matchup doesn’t matter for Kamara. That’s not a joke. Matchups just don’t matter. What matters more than anything for Kamara is the game script and the total. We want to target him in high scoring games that should stay close, or if there is a chance that the Saints fall behind. Well, we have that this week when the Saints take on the Steelers. The Saints are 5.5 point home favorites, projected to score just over 29 points. His touch volume will never be as high as the other studs in his price range, but not all touches are created equal. He’s going to get high upside targets in the passing game, and will be heavily involved in the red zone, both as a rusher and a receiver. He’s not a lock in cash games, just because he is splitting time with Ingram. In tournaments though it would be wise to stack this game a few ways…and I’d have Kamara in all of those stacks. We’ve been waiting for McGuire to get healthy all season, and he finally is. He has 20 and 21 touches in his last two games, with a steady 4 targets, and the goal line duties in both games. He’s not a guy that’s going to break the slate, but he is a cheap option for 20 touches, and has a path to 20 points if the game doesn’t get out of hand. To the surprise of many, the Jets are only 3 point underdogs this week at home against the Packers. Darnold has been playing much better as of late, and has shown significant home/road splits in his first season. If the Jets can keep this game within a TD for most of the game then McGuire is going to pay off his price tag. Another cheap option is Trenton Cannon in this same backfield. Box score watchers will see the same amount of targets and think that he wasn’t involved, but he was heavily involved early last week before the Jets shifted away from him. He’s by no means a cash play, but he’s worth a shot in tournaments at what I can imagine will be sub 2% ownership for $3,400. Ballage is a good value play this week if you need the savings in your FLEX spot. I’m very unlikely to go there myself, as Drake is still going to see some touches, and the Jags are an elite defense. The Dolphins are 4.5 point home favorites, so there is some hope that they can get Ballage 15-17 touches in this game. Without a TD though he’s unlikely to get more than 10 or so points. RB is such a valuable position, with so much certainly, that I’d rather just find a way to get up to the studs. I get it if you want to play him in your FLEX though. Just don’t think this is a sneaky play or anything. I’d like to start out by saying that it’s never optimal to pay up at WR on a full slate. You can do it on a smaller one like the afternoon slate, or showdown of course…but not on a full slate. It’s so important to play a RB in the FLEX on 100% of your lineups, and to pay up for at least one, most of the times two, and sometimes 3 RB’s. Because of this, I’ve played a lot less Adams than I care to say. However, when I do choose to pay up, it’s with Adams. He’s by far the safest and most consistent WR in the league right now, and he still comes with monster upside. Again…IT’S NOT OPTIMAL TO PAY UP AT WR! But if you want to in a tournament, I’d make it Adams. The Jets run a lot of man coverage that Adams should destroy, and he’s really the only person that Rodgers trusts on the entire offense. He’s going to get 10+ targets, and he’s got the best shot among all skill position players at a TD. Just don’t play him in cash…or on Yahoo where the price is a bit insane. The news about Juju is going to change the slate. If he’s in then we can approach the slate like we want to. Play 3 high priced RB’s and go cheap everywhere else. If he’s out then it changes things. AB would likely get 15-17 targets…and would likely become a cash game lock. I hope we get this news on Saturday…and I pray that we know before lock on Sunday. If we don’t know before lock then I’m going to treat Juju as in and AB isn’t a cash game lock. If we do know then you probably have to play AB. The Steelers are going to lean pass heavy regardless…so you can still expect AB to get double digit targets with Juju in. But he’s just a tournament play. I’ve been massively overweight on Foster back to back weeks now, and I’ll look to make it three in a row this week. I won’t have nearly as much this week (I was over 90% last week) but people just don’t want to play this kid…so going overweight isn’t tough. He’s been over 90 receiving yards in four of his last 5, and is playing on nearly every snap. He went for over 100 and a TD last week, even in a game where Buffalo was able to slow things down late and kill the clock. Well, this week they travel to New England to take on my Patriots. It’s by no means an easy matchup when you play in NE, as the Pats always play a lot better at home, but it’s a high upside matchup. The Patriots play a lot of man coverage, so they can get beat on deep routes more than most teams. It’s tough paying 5K for a deep threat that we’ve been paying 3.3K and 4.3K for…but it’s still a miss pricing for his role and potential upside. Zay Jones is terrible and so are their TE’s. It’s going to be Foster and McKenzie getting the work in the passing game. McCoy looks like he’s going to play this week which is a downgrade to the passing attack, but he’s all they have healthy at RB so I can’t imagine they give him too much work. I’m wrong about ownership all the time…but I can’t imagine Pettis is any more than 10%-12% owned. So while he’s not super low owned, he’s for sure not going to be chalky on this slate. The 49ers have a home matchup against the elite Bears defense, in the 3rd lowest total game of the week. None of that bodes well for Pettis. What does is his individual matchup and the projected game script. The Bears are one of the best teams in the league at stopping the run, and have forced one of the highest opposing pass rates in the league. Pettis has target counts of 6/7/7/7/5 since returning in week 10, and has over 80 yards or a TD in 4 straight games. THIS IS NOT A GOOD MATCHUP. I want to make that clear. But Pettis should see 6-8 targets, and at his price, with his skill set, that’s valuable. If you pair him with Foster then it gets you closer to fitting in 3 stud RB’s while keeping your WR upside intact. This is only an option if Juju is unable to play this week. If Juju is in then I like the WR’s listed above more than Eli…even with the discounted price. If Juju is out though then Eli turn into a near every down player. We saw last week that ,while he’s not a high upside option, Eli is able to rack up receptions quickly. He started off the game hot before being left out of the offense in the second half. The Steelers are projected to be trailing in this game, and the Saints are most attackable from the slot. AB will surely play some slot if Juju misses…but Eli will play there more. I’m having a tough time guessing how owned Heinicke will be. On the one hand he’s a min priced QB, that’s fairly mobile, playing a mediocre defense. On the other hand we need to realize something Vegas is telling us right off the bat. First of all Newton has been terrible the past month. Something was clearly wrong, and the Panthers have suffered as a result. Even with these struggles the Panthers total dropped from 25 to 20 after the news that Newton would miss the game was released. That doesn’t exactly instill confidence in Heinicke…and I don’t love taking a QB in such a low total game. This week I’m willing to roll the dice. Heinicke was solid passing the ball in the preseason, and showed that he can get us some points on the ground in a full game. It’s also an easy stack with CMC, and most importantly, he offers us savings. There are a few pay down options this week, but nothing like we are used to. I haven’t made a cash game lineup, but I’d say he has a strong chance of making it into that. As long as he’s under 10% owned, I’d feel good going overweight. Just don’t go crazy. Allen isn’t a cash game play as I prefer the savings that Heinicke offers. He’s another easy and cheap stack in tournaments though! Allen/Foster will allow you to pay up for some of the stud RB’s, while not tanking your roster if they fail. Allen is still under priced for what he offers with his rushing upside, and with the Bills projected to lose this game by nearly 2 TD’s, they are very likely to abandon the run early. That’s going to lead to more attempts, both through the air and on the ground, for Allen. I want to remind you that he’s just a tournament play though. The Bills are projected to score a whopping 15.5 points. Engram comes in at a fair price on both Yahoo and DK this weekend in his road matchup with the Colts. Eli is washed at this point, but that doesn’t mean we haven’t been able to target the Giants skill position players. The one caveat to this pick is Odell. He needs to be out. If Odell plays then Engram becomes just a tournament play at low ownership. He’s seen 17 targets over the last two weeks without OBJ, and has 75 or more receiving yards in both weeks. The Colts have been better than most think on defense this season, but they struggle to defend pass catching RB’s…and TE’s. They have given up the most receiving yards per game to the position, the 5th most targets per game, and a 14% DVOA increase above league average. If Odell is out, then Engram should be a good bet for 6-8 targets in this game. The Giants are projected to lose by 10 points, so the game script should be perfect. If you don’t want to play Engram, or you need the savings, then I’d go with Uzomah. The matchup with the Browns is solid, and there just aren’t many options in the Bengals offense. Green is out, Boyd is out, and now Mixon is on the Injury report. There is no way they are winning this game, so they are going to have to throw the ball. When they do their receivers are John Ross, Cody Core and Alex Erickson. John Ross has been terrible, and is going to be shut down by Denzel Ward. So their only real hope of moving the ball is with Core, Erickson and with the TE’s. They’ve been better this season against TE’s…but it’s not like Uzomah needs to do much to pay off. I’m using Engram, but Uzomah would be my next pay down option.